This is my first post about a restaurant in Queens. 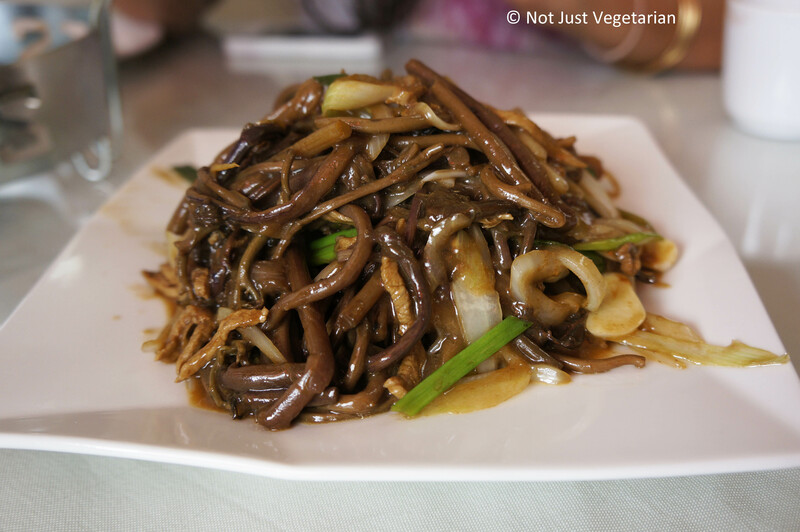 I went to Lao Dong Bei, in Flushing (Queens) for lunch on the suggestion of a fellow food blogger, Restaurant Fairy. She brought along another friend who spoke Mandarin, heeding the advice of Ligaya Mishan who wrote about Lao Dong Bei for the NY Times. Lao Dong Bei is a restaurant that serves food from the Dongbei region (formerly known as Manchuria) of North Eastern China. The restaurant is owned and run / managed by this couple. 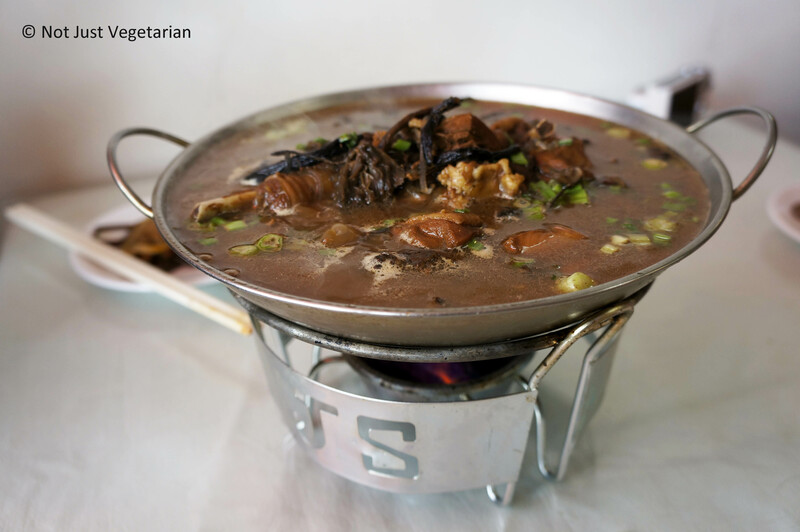 Lao Dong Bei is a relatively small restaurant, but its (English) menu runs almost 6 pages and has the standard variety of meat, poultry, sea food, and vegetarian dishes. 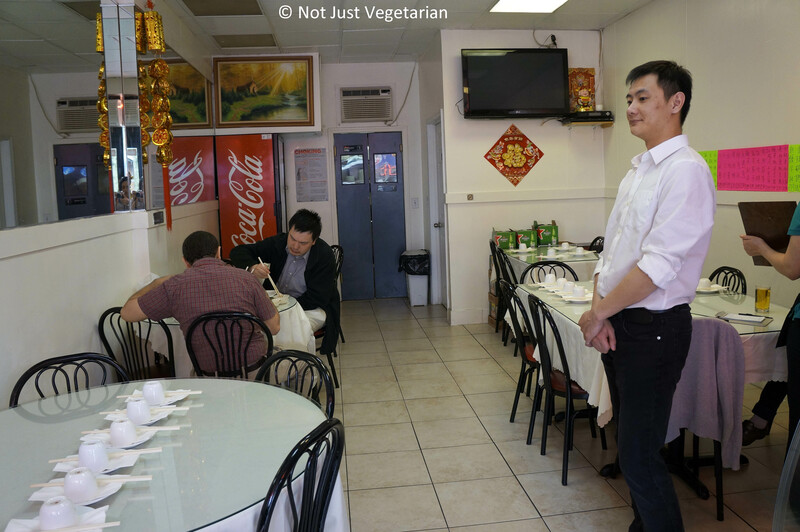 I was keen to try some of their vegetarian dishes. We also wanted to try some of the dishes recommended in the NY Times review. Our Mandarin speaking friend was in charge of ordering our dishes for lunch that day, and in talking with the chef-owners, she was told that they have a special dish with a special ingredient that is not listed on the English menu, but is on menu on the wall (in Mandarin!!). Lao Dong Bei’s service was very attentive, although I must add that they knew that we are food bloggers. 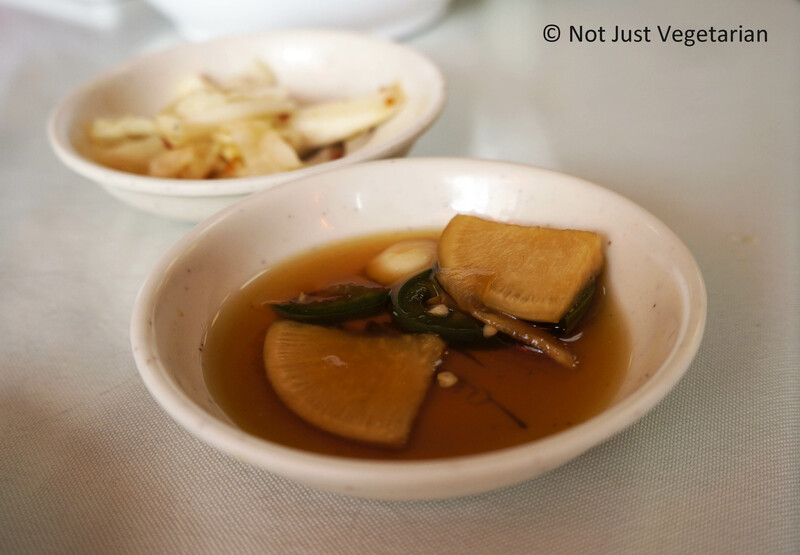 I liked Lao Dong Bei’s vegetarian dish (triple delight vegetable – the one that I tried) and the fried fish dish. The other dishes that I had were too intense in flavor and smell for me to enjoy them. 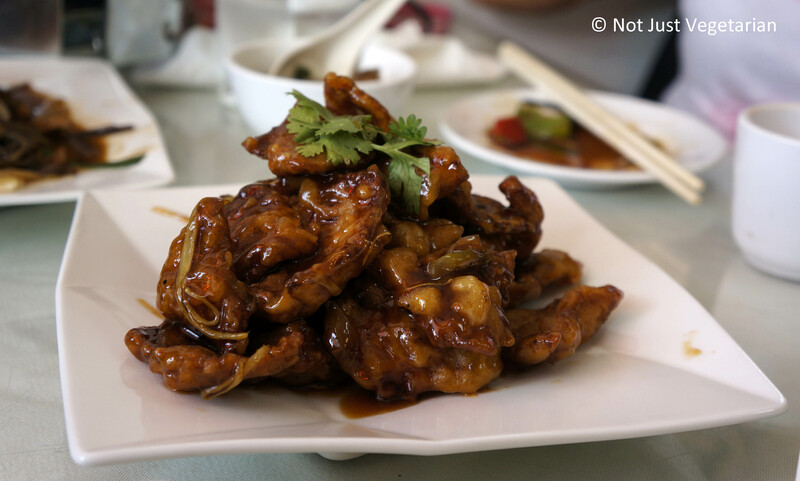 We ordered a special dish recommended by the host, chicken with mushroom and vermicelli, crispy sliced (fried) fish with cumin (highly recommended), a fried pork dish, and triple vegetable delight. We were served a dessert combo on the house. 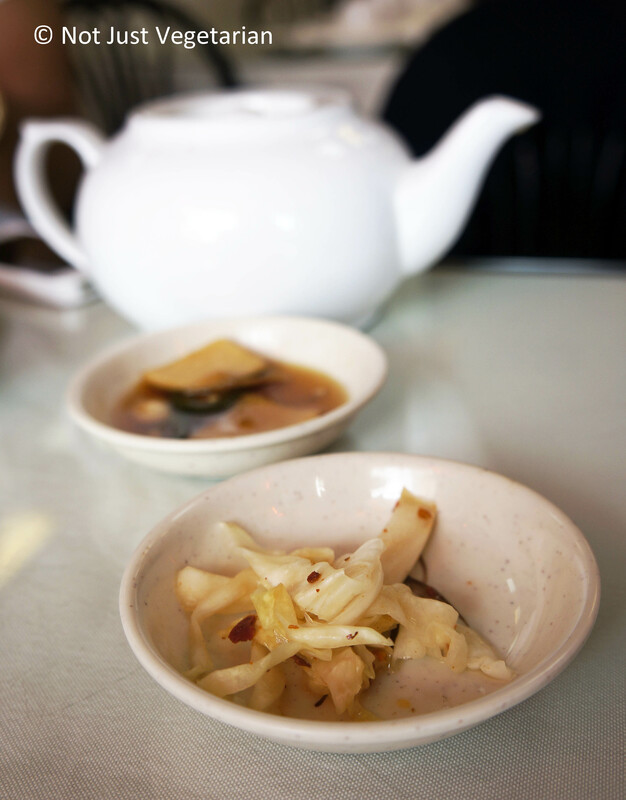 I also loved the pickled daikon and jalapenos and the pickled shredded cabbage. A root vegetable (wish I got the name from the chef-owners) grows only in the mountains of North Eastern China and Japan in a specific season (Spring?). It is dehydrated and imported from China / Japan. 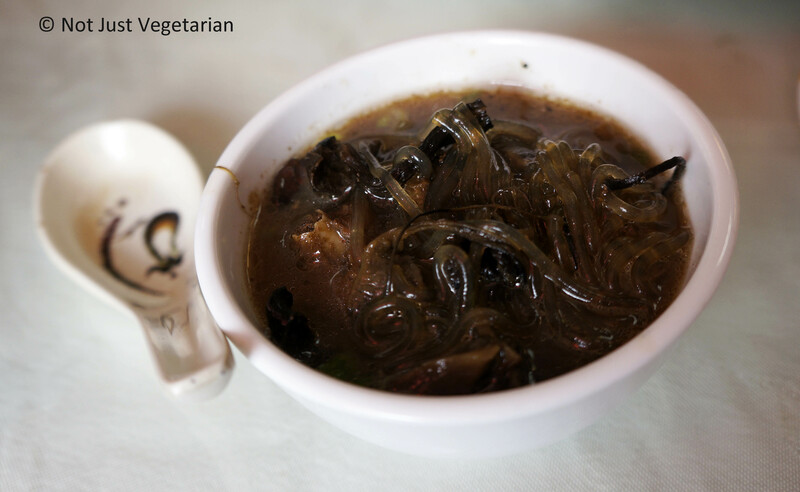 The dish prepared with this vegetable is off the regular English menu. We ordered this dish given the chef-owners’ recommendations. What they did not tell us is that this dish would be served with pork (not a pleasant surprise for me) and noodles. This dish smelled of soy sauce and garlic, and of pork. I can’t say that I loved this dish, but then, people who like the smell and taste of pork would. We ordered chicken with mushroom and vermicelli. This was a hot bubbling wok of soup / sauce in which the chicken was being cooked. This would be a welcome dish / soup on a cold day. The vermicelli was more like glass noodles. It was tough to eat/ drink this soupy dish without slurping the broth or the noodles, not that it mattered to anyone at the table that day. The fried pork dish was not a favorite of mine. 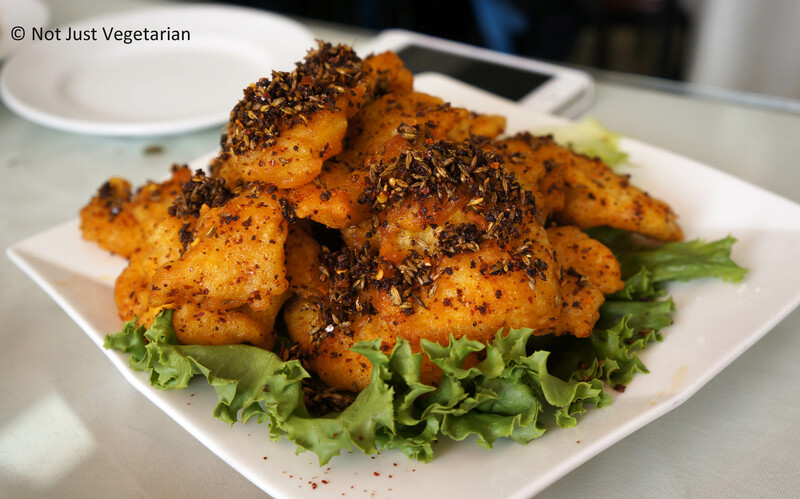 One of my favorite dishes of the day was the crispy sliced (fried) fish with cumin. 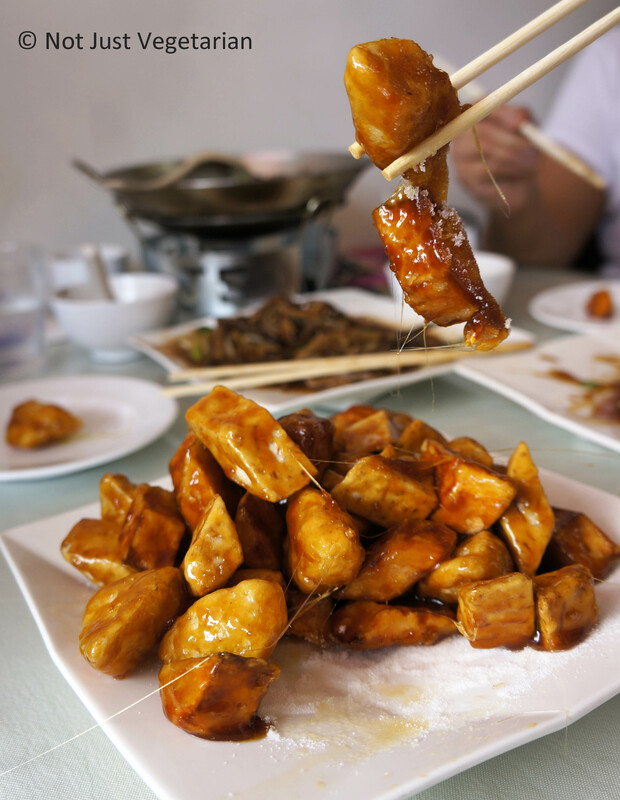 The fish was dipped in a mildly-spicy orange-colored batter and fried – it was simply delicious!! The roasted cumin and red pepper flakes (and sichuan pepper?) sprinkled generously on top added some crunch and heat to the soft, flaky mild fish in the batter. 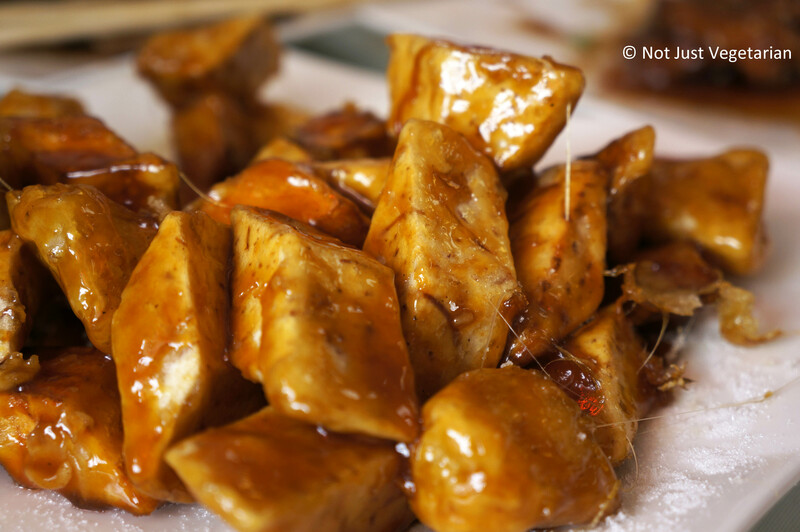 This is a highly recommended dish for the flexitarian / pescetarian readers of this blog. My other favorite dish of the evening was the Triple delight vegetable. 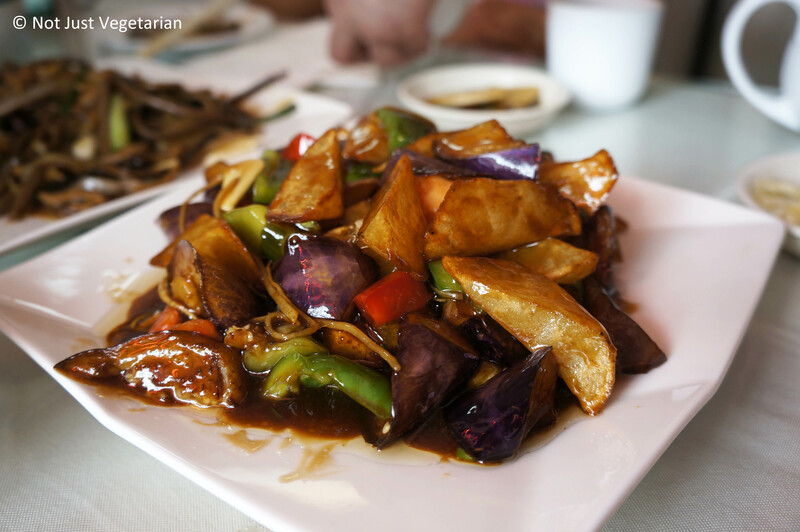 This dish had strips of red and green bell peppers, diced chinese eggplant, and potato wedges stir fried in a mouth-watering sauce of soy, garlic and vinegar. If I were to get this dish with some plain warm rice on a cold day, my day will be done. The chef-owners were so pleased that food bloggers were visiting that they gave us a dessert on the house. The dessert was really 3 different dessert items on the menu combined to make a huge dish. There were apples, sweet potatoes, and taro tossed in corn flour and fried with sugar being added to the pan at the last minute, so it caramelizes around the fruit / vegetable pieces. This dessert was so warm that we were given instructions to dip the piece we pick into a bowl of cool water, so we would not scald our mouth.. Can you see the strings of sweet syrup from hanging from the corner of the plate to the bowl on the right? I wish every Chinese restaurant would serve such a unique dessert. The caramelized syrup coating the vegetable / fruit pieces had become solid, and yet was brittle. I liked apple and sweet potato pieces over taro in this dessert. I would go back to Lao Dong Bei (despite the lack of proximity from where I live) and try some of their other vegetarian dishes. Vegetarians and vegans, however, would have to confirm that a dish listed in the “Vegetarian” section is indeed completely vegetarian /vegan. So, please go with a Mandarin speaking friend to make sure that you get what you want. 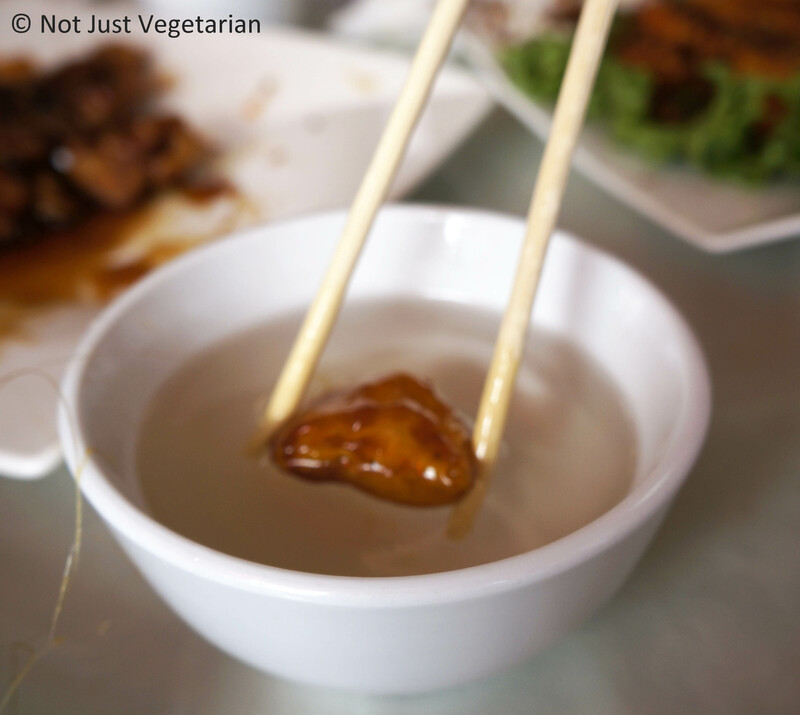 Go to Lao Dong Bei, try some other vegetarian / vegan dishes and tell me what I should eat there. Note: The restaurant does not have a website yet and does not have a Menu Pages listing yet either.